Breaking the season up into quarters has proved to be a useful measure of progress. I started this last season, and have referenced it over and over again for my own use. You can find the final 2011 Season Progress Report by clicking here. The report can show trends as the season wears on. You can find the 2012 quarter-point progress report here, and the mid-season progress report here. Look at all that green for the offense, and all that red for the defense. It should come as no surprise that the two units are going different directions. However, the real narrative is in the details. Russell Wilson has been a revelation, yet the passing offense has moved up only one spot to 30th in the NFL and the yards per attempt has remained the same as it was after eight games. So how does the team’s passer rating jump a whopping 13 spots to 6th-best in the NFL? Two things: red zone efficiency and fewer turnovers. The team’s rise in the red zone is stunning. After four games, this team was dead last in the NFL, and was converting only 27% of their red zone opportunities into touchdowns. They have climbed into the top half of the NFL just eight games later, and have been executing at a Top 5 clip for some time. They are at 87.5% over their last three games, which is tops in the NFL. Converting 3rd downs remains a work in progress, but has improved. The defense offers a more challenging mystery. Everyone that has watched the team knows the defense has not played as well the last few games, but some key numbers are stable. They are allowing the same number of points per game, and are closer to #2 in the league than #4 in that all-important category. The defense has climbed eight spots in the rankings and shaved 24 yards off opponent passing totals. Opponent passer rating, and opponent 3rd down conversions have both improved as well. Those don’t exactly point to a slumping defense. The quality of opponent, though, matters here. Seattle faced Kevin Kolb/John Skelton, Tony Romo, Aaron Rodgers, Cam Newton, Sam Bradford, Tom Brady, Alex Smith, and Matt Stafford in the first eight games. They have faced Christian Ponder, Mark Sanchez, Ryan Tannehill and Jay Cutler the last four. The team would not have to play better in order to improve their defensive passing stats. The weaker competition would do some of that on its own. Then, there’s the rush defense erosion. Seattle went from what was essentially a Top 5 run defense to being in the bottom third of the NFL just four games later. That is not even the biggest concern. The rise of Seattle’s offense has meant the defense has been on the field for fewer plays. The defense dealt with an average of 58 plays in the first four games, 65 in the next four, and only 52 in the last four. 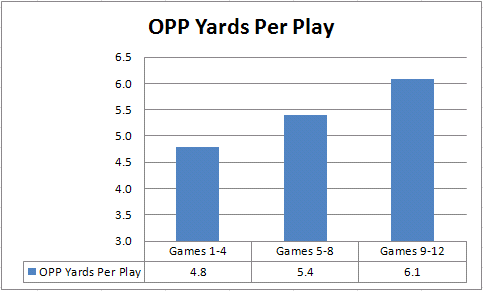 Despite the opposing offenses having fewer plays, the defense is showing a steady increase in yards allowed per play. The worst defenses in football give up 6.0 yards per play and greater. 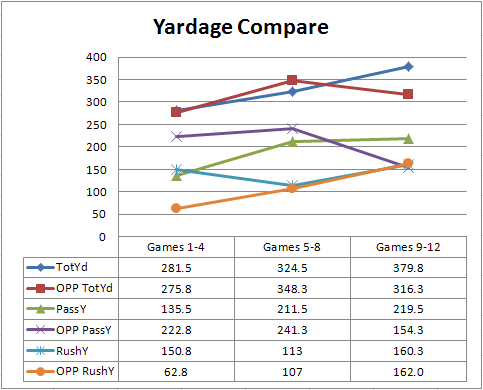 Only four teams are giving up 6.1 yards per play or more for the whole season. Seattle still checks in at a respectable 5.2 on the year, but these last four games are worrisome. The way this should work is that as the Seattle offense improves, so should the Seattle defensive numbers. We saw this play out last season toward the latter half of the year. Opponents also tend to be behind more often, throw more, and turn the ball over in greater numbers. That simply is not happening for this defense yet. Explosive plays are going to be a key area to watch for this team, both on offense and defense. 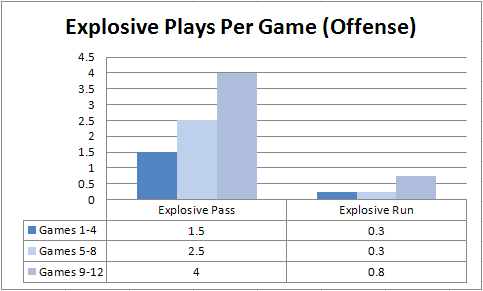 Explosive plays are defined here as 20+ yards. Usually, 10+ yards counts as an explosive run, but the NFL does not publish that stat. This is one of my favorite illustrations of the growth of Wilson and the offense. Some will tell you the team is not asking much of Wilson, but he is making more big plays in the passing game with each passing week. The jump in explosive runs is also attributable to his larger involvement in that part of the offense with the read option. He had at least a few explosive runs versus Chicago. The Seahawks averaged 3.2 explosive passes per game last season. They are now out-pacing that number. 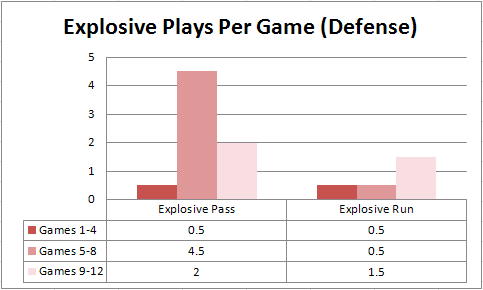 The defense has improved from the five explosive plays they were allowing per game in the middle of the season, but much of that would seem to be explained with the difference in facing Brady and Stafford versus Sanchez and Ponder. Cutler was the best quarterback they faced in the last four games, and the Bears are near the bottom of the NFL in yards per attempt. Those first four games remain the benchmark when there was tough competition, and yet, opponents were walking away with a remarkable one explosive play per game. Bobby Wagner is on pace for 135 tackles, which would set the Seahawks franchise record for rookie tackles in a season. He is 3rd among NFL rookies in tackles. K.J. Wright is on pace for 101 tackles, which is down from the 130 tackle pace he had been on after eight games. Kam Chancellor is on pace for 107 tackles, which is down from his 120 tackle pace after eight games. He has no sacks, no interceptions and no forced fumbles. Richard Sherman is on pace for 5 interceptions, and 21 passes defensed. Marshawn Lynch is on pace for 1,517 yards rushing, which would be a career high. Chris Clemons is on pace for 11 sacks, down from his pace of 14 after eight games. Bruce Irvin is on pace for 9 sacks, which would set the franchise rookie record. Seattle went 2-2 in the first four games, 2-2 in their next four, and then finally broke the pattern with a 3-1 record in their last four. The way they did it looks very different than the way this team won early in the year. 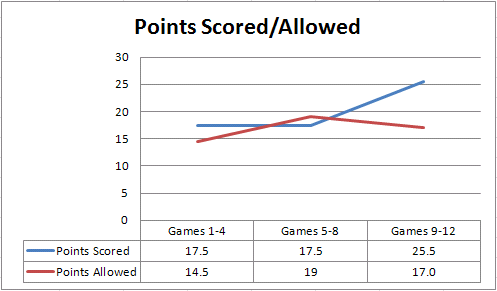 The charts below will illustrate how different this team has been the last four games, for better or for worse. The scoring has picked up considerably, and Seattle’s margin of victory is far larger than it has been at any other stretch of the season, thank in large part to the Jets and Vikings home games. Even the six-point victory over Chicago would qualify as a big margin compared to the first eight games. Seattle averaged 25 points per game the last eight games of 2011. They are now matching that output. Opponent scoring has dipped, but it remains a question how much credit the defense should get for that versus the opponents and the offense eliminating opportunities for opposing offenses by staying on the field longer. The drastic decrease in giveaways is the untold trend of this season. Going from two per game to less than one is an amazing improvement. That has everything to do with Wilson making better decisions. Takeaways remain a mediocre aspect of this team. If they can break through on that aspect, Seattle could go on a nice win streak. This one can be a bit of an eye chart. 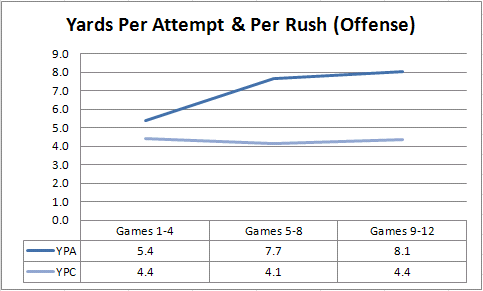 The best way to read it is each group of two lines are the comparable offense and defensive numbers. The top two are offensive yards per game and defensive yards allowed per game. The next two isolate passing yards and rushing yards. This show the strong and steady improvement of the offense, as they have added nearly 100 yards per game compare to the first quarter of the season. 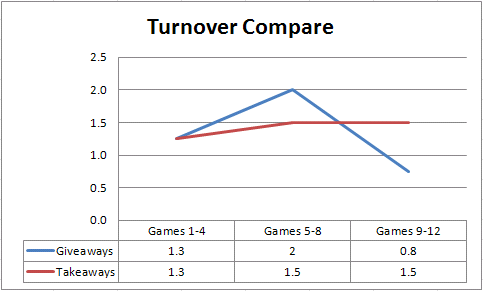 That’s not just about passing, though, as the rushing game has rebounded to reach their best level of the season. The read option has a lot to do with that. 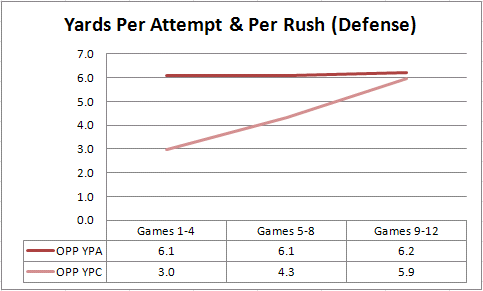 Again, we see that the rush defense is in major trouble. While everyone is worried about what happens to the pass defense without Richard Sherman and Brandon Browner, I’d say the bigger question is how this team can stop the bleeding against the run. The best mark in football for yards per attempt is 8.2, so Wilson is right there. The rushing game has been steady. The offense has gone from pre-natal to adolescent to precious teen in short order. This team would be in a bad way if that growth and development had not happened. The defense is not the disaster some would have you believe, but the trends are concerning. They should be able to feast on these lesser opponents, especially with the offense giving them more rest. Takeaways remain the key issue there. This team needs to start creating some turnovers. The offense is proving it can be productive and protect the ball. That needs to continue in order to benefit at all from an increase in takeaways. The next four games include three home games, all against division rivals, who the Seahawks are 0-3 against on the year. Their away game is winnable against Buffalo, but no road game has been easy for this team, even against inferior opponents. There are some teams, like the Redskins, that look to be finishing strong. Seattle likely needs ten wins to ensure a playoff spot. That would require another 3-1 stretch. That should be the expectation, with 4-0 being a realistic possibility. Given where this team was after a horrible loss to the Dolphins last week, talking about 11 wins is surreal, and likely premature. This team needs to prove it can sustain good play over a longer stretch of time.